Our Korean War Veterans saved a nation from a future of unimaginable bleakness, restored an Ally, and stopped Communist aggression. They did so not for glory or national grandeur. They defended Freedom, protected Freedom, and preserved Freedom in Korea because the United States of America, asked these “Greatest Generation” young men to do so. That is worth remembering and respecting. Nearly seventy years after they received the life-changing — “I regret to inform you…” telegrams that their loved ones were Missing in Action, many American families have renewed hope that the remains of their American heroes may yet be returned from North Korea for the honorable internment they deserve. Previous searches were complicated by not knowing where these soldiers, airmen, and Marines were buried. Recovery searches were carefully controlled by the North Korean government. Reports indicate that most searches took place near former prison camps, a time-effective decision made to ensure as many remains as possible were recovered in the short time allowed by the North Korean government. When successful, most remains were Army or Marine Corps troops. Few were Air Force or Navy pilots who were more likely to perish during missions in remote areas. (L-R) Capt. Leslie Wayne Lear, USAF (Santa Cruz, CA), Ensign Ronald D. Eaton, USNR (Wilmington, MA), and 1st. Lt. Archie Connors, USAF (Jacksonville, FL), were killed during Mission 1890, the Korean War’s deadliest helicopter rescue mission. 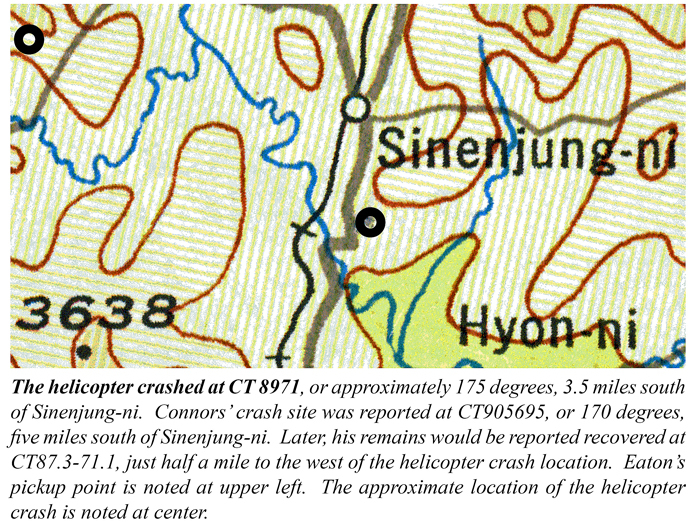 However, the burial site of two of the three brave airmen killed in the Korean War’s most deadly helicopter rescue mission is known from reports by both Navy and Air Force records. If asked, the North Korean government could go directly to that site and recover the remains of Capt. Leslie Wayne Lear of Santa Cruz, CA, and Ensign Ronald D. Eaton, of Wilmington, MA. California has 593 Korean War unaccounted for, Massachusetts, 190. Captain Lear was the incredibly brave pilot of an H-5 Dragonfly helicopter whose mission that hot Wednesday, June 25, 1952, was to fly through blistering ground fire with his medical technician, Sergeant (later MSGT) Bobby D. Holloway of Ruston, LA and San Rafael, CA , to rescue Ensign Ron Eaton, whose F4U Corsair mission from the USS Bon Homme Richard (CV 31) had ended earlier that morning when he was shot down by radar-directed fire near Wonson, a seaport in eastern North Korea. 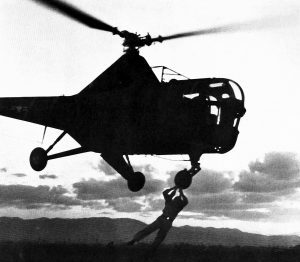 H-5 Dragonfly helicopter during rescue hoist operation. After two attempts under constant, heavy fire to extract Ensign Eaton from the brush-covered hillside that was “alive with fire,” Lear was wounded and his lumbering little helicopter was shot all to hell. He could have scrubbed the mission and returned to his base, but he didn’t. A third time he trolled the life line through the brush and this time the brave Ensign caught it. Lear wrenched the shaking, damaged helicopter away and down the valley heading towards American lines just 20 miles away. But the rescue was not to last, several miles away the helicopter was hit again, this one bringing it down from low altitude. Three jumped, one survived, Airman Holloway. 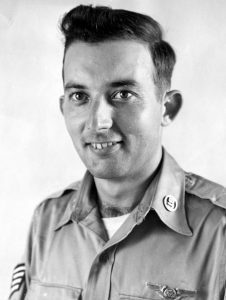 Just minutes after the helicopter was shot down, 1st Lt. Archie Connors of Jacksonville, FL, was making a low pass over the scene trying to determine whether there were survivors. Hiding in the brush to avoid ground fire, Holloway saw Connors flip his F-51 Mustang up on its left wing to give him a better view as he flew over so low that Holloway saw him looking down. At that moment, his plane was hit by heavy ground fire. “He went over the hill and out of sight,” Holloway recalled. After a brief radio message that he was hit, Connors dead-sticked his crippled aircraft into a pancake landing about a mile away. He did not survive. The remains of 1st Lt. Archie Connors, USAF were repatriated without explanation in 1955 during Operation Glory. Airman (MSgt) Bobby Holloway, USAF, the only Air Rescue Service medic to return from being a POW. The Korean War is sometimes called the “Forgotten War,” despite the fact that those who fought and died there gave hope and a bountiful future to nearly 50 million South Korean people. The sacrifices of our Korean War Veterans and the enormous debt we owe them for saving South Korea from tyranny deserve to be remembered and recognized. We should remember the Korean War is not forgotten to the South Koreans who gained a new future thanks to Korean War Veterans. The Korean War is not forgotten to the many thousands of Veterans and their families whose lives were changed forever as a result of their service and sacrifices while reversing aggression and tyranny. And, the Korean War should not be forgotten by any American since it proved, once again, that the price of peace is eternal vigilance—and a willingness to defend Freedom—ours and our Allies. We should remember—and honor—our nation’s pledge to bring these heroes home again, if at all possible. I know you share my deeply held belief that we not leave our Veterans who died in the line of duty defending Freedom…or our national honor…behind. It’s time to bring Wayne, and Ron, and all the other heroes who died protecting Freedom in the Korean War, home again.